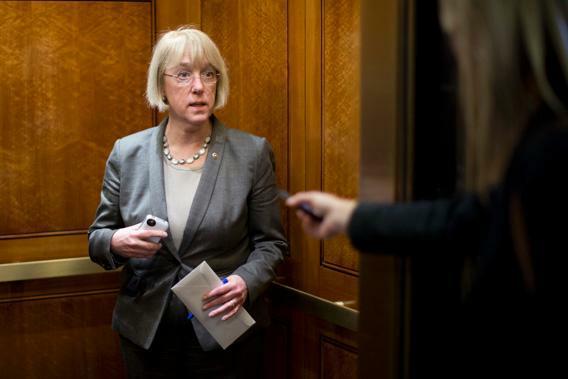 Dueling budgets: Paul Ryan’s budget framework is thrilling; Patty Murray’s is timid. Why is Patty Murray’s plan so boring compared with Paul Ryan’s? The rival budgets laid out this week by House Budget Committee Chair Paul Ryan and his Senate counterpart Patty Murray are almost perfectly calculated to mock establishment dreams of a grand bargain. Murray’s Democratic budget completely eschews the structural cuts in entitlement programs that Republicans and bargainers demand, while Ryan’s GOP plan avoids any hint of higher tax revenues and almost laughs at the idea that the 2012 election should have any consequences. Democrats would respond to 30 years of rising inequality by taxing the rich to pay for the health care, retirement, and education needs of the bottom two-thirds. Republicans would supercharge growth by taxing the rich less and downsizing the safety net, giving everyone stronger incentives to work and earn for themselves. Beyond the ideological divide is an equally stark conceptual disagreement about the purpose of the budget. The Republicans have given us a blueprint for sweeping social transformation; the Democrats a small-c conservative effort to assure us that nothing much needs to change. Ryan’s budget is almost frighteningly ambitious. It purports to balance the budget in 10 years. It transforms Medicare into a voucher program over 20 years. It undoes the Affordable Care Act. It removes the federal “floor” from state Medicaid benefits. It cuts food stamps and Pell Grants. It rescinds a key element of the Dodd-Frank financial regulation bill and would radically alter American housing policy. It initiates a massive transformation of the tax code, cutting the top income tax rate from 39.6 percent to 25 percent and making up for the difference with unspecified loophole-closing. Descriptions of Ryan as a “courageous” thinker are overblown. At key moments, his relies on magic asterisks and punts to other committees for clear thinking. It’s a class-war budget on behalf of the rich, keeping their taxes low and making the poor and the middle-class pay. But it certainly reflects the old saw about making no small plans. Murray’s budget for the Democrats is the reverse. In distributive terms, she taxes the rich to preserve programs for the poor and middle-class. But it’s also the reverse conceptually—a de minimis scheme aimed at addressing the budget challenge with as little change as possible. It’s conventional to score budget proposals over a 10-year time horizon, and so Murray’s plan is designed to produce a low and stable budget deficit within that window. It doesn’t balance the budget, since the budget doesn’t really need to be balanced. It doesn’t really address the growth of Medicare, Medicaid, and Social Security outside that 10-year window, because what’s outside the window doesn’t really need to be addressed. It doesn’t transform the tax code. It bites at the lowest-hanging fruit of deductions for the wealthy and big businesses. And it doesn’t transform any programs, nipping and tucking just enough to hit deficit reduction targets while being equally balanced between tax hikes and spending cuts. That’s in many ways a retreat from where Democrats were just a few years ago. Obama’s original budget proposal in 2009 assumed the existence of revenues from a plan to auction tradable greenhouse-gas emission permits. That money would have funded a permanent extension of the new-defunct Making Work Pay tax credit that subsidized the labor income of the working poor. Like much of Ryan’s budget, that wasn’t really budgeting at all. It was environmental policy combined with income redistribution. It was a statement of a progressive vision for the future. Such ideas are still out there. The center-left Hamilton Project recently released a 15-point budget proposal structured around deficit-reduction measures aimed at public policy goals. That’s where you’ll find ideas like a $199 billion carbon tax or a $312 billion plan to fund transportation projects with congestion pricing. Further left policy shops are pushing for ideas like a financial transaction tax. Murray’s budget unifies the oft-fractious Senate caucus by eschewing interesting ideas of any kind. From a columnist’s perspective, there’s not much to like about Murray’s approach. It’s boring and it doesn’t lend itself to back-handed compliments about how you’ve got to respect her vision. But it reflects a modest wisdom. Ryan’s transformation of the budget document into an all-purpose ideological vehicle has done great things for his career. But it’s a poor basis for thinking about policy. Budgetary topics mix with nonbudgetary ones in an unprincipled way. Ryan’s desire to transform Medicare from an open-ended commitment to finance whatever health care services senior citizens’ doctors happen to bill into a program with a fixed budget is worthy. His plan to transform it from a public sector program that’s able to drive a hard bargain with doctors and other health care providers into a voucher scheme to buy private insurance isn’t. At a minimum, these ideas deserve to be considered on separate tracks. Similarly, the fate of Fannie Mae and Freddie Mac shouldn’t be yoked to a debate about tax rates. The quest for a grand bargain has pushed America into an era of apocalyptic budgeting, where incentives exist to squeeze every policy idea under the sun into the long-term deficit conversation. That’s no way to run a country, and it’s especially no way to do business at a time when interest rates are low and the deficit is already falling. Here’s hoping that in the future, both parties in both houses of Congress do a budget as boring as Murray’s and leave space for other issues to be discussed in more appropriate venues.